I am sure this is no news for you anymore –Hurricane Sandy is expected to impact the Eastern coasts of the United States, parts of Ontario, Quebec and the Maritimes over the next few days. 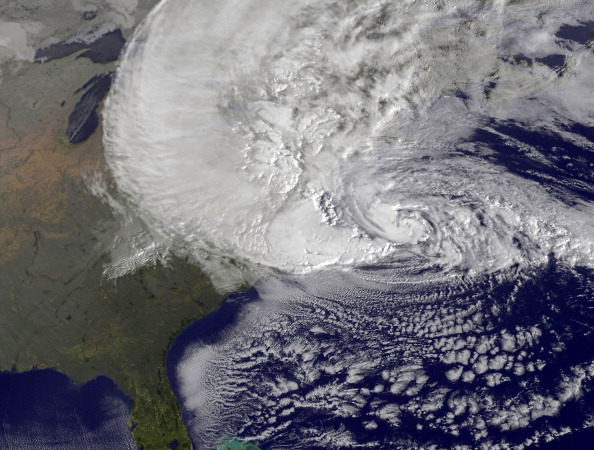 Sandy is huge – covering over 1000 miles – and the impacts of heavy rainfall, high winds and possibly snow will be likely experienced well away from the centre of the storm. These conditions could lead to downed trees and power lines, power outages and flooding. Water: You should have 2 litres of drinking water and 2 litres of water for washing per person, per day and keep a 72 hour supply for your family and your pets. Food: Prepare at least 72 hour supply of non-perishable food for each person – and remember the can opener! Flashlight: Crank or battery operated – and make sure you have extra batteries on hand just in case. Radio: Crank or battery operated – with extra batteries. A shortwave and emergency radio is also a good thing to have on hand. Keys: Keep with you extra keys for your house and your car. You never know what you may need. Now that you’ve got the basics covered you might want to consider a few additional things to make your life liveable in the event of an emergency that lasts more than a few hours. It’s not only about survival, it’s also about comfort. The benefit of the BioLite stove is two fold. Firstly, you can heat and cook using twigs, leaves or anything else you find although I would suggest using it outdoors or in a well ventilated area it can provide you with heat to boil water. The second and amazing advantage of the BioLite is it’s ability to charge devices indefinitely allowing you charge phones, lights, batteries or any other device that is capable of being charged via a USB port. Having the ability to purify water isn’t only handy, it’s effectively limitless for the duration of the emergency allowing you to filter water from various sources including rain water without need to worry about running out. While this could easily go south on you depending upon the nature and severity of the emergency having a camp style purification system on hand will certainly ensure you aren’t stuck without fresh, clean water. Since we are iPhone users (Android people please calm down) you can conserve quite a bit of iPhone power by doing the following: Turn off your “Location Services” under privacy and turn down the brightness a bit to save power. Lastly set your Mail settings to “Pull” as you don’t want to waste power checking for email every X seconds or minutes, turn off “LTE”. If the emergency goes on for a long time (or power is out for an extended period) turn on “Airplane Mode” then just activate your wireless when you need to text or call.If you’ve got an Android, Blackberry or Windows Phone there are similar settings which will help to conserve your battery life. Cash – in small bills and change. Don’t reply upon credit cards or debit cards during any emergency situation. As the power goes, so to goes the credit. Special needs items – medications, baby formula and diapers, any equipment needed for people with disabilities, etc. Blankets or sleeping bags. Keep a good supply on hand and also put a few into garbage bags in case of a flood, there is nothing worse than watching your warm clothes and blankets soak up with water. Necessities: Toilet paper and other personal supplies – like and extra pair of glasses. Notebook with important family information – list of any medical conditions, severe allergies, pacemakers and other critical information. Documents: Photocopies of all important identification for you and your family, including passports, health card numbers, driver’s licenses, etc. Maps. Hard copy maps in large ziplock bags. Hope you will adopt that good old motto – and “Be Prepared”. Do you have anything else to add to the list above? I’d love to hear your comments and thoughts and most importantly your additions! Thanks so much for the information about the BioLite stove! I’m so impressed with the fact that it will also charge our gadgets too. I want to get one of those!